Colton Dixon performed a BAD rendition of Lady Gaga’s “Bad Romance” this week on American Idol and paid the ultimate price. Colton’s rendition was so bad that even mentor Jimmy Lovine, who has been a huge fan said, “it was all wrong, the look, the song, everything and it disappointed.” After the horrible performance, Americans stood up, 53 million of them to be exact, and after the votes were counted they had given the “cocky” singer the Idol axe. Did you see the show, if not you can see his video performance HERE. 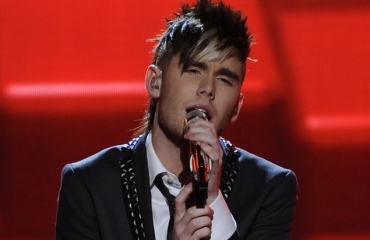 Personally I have never been a fan of Colton – not even from the beginning. I could never see what all the hype was about him anyway and although he hit the notes most of the time, the whine in his voice was like razorblades on a chalkboard. The whine mixed with the faux-rocker posing just made me want to see him get voted out already. But if that was not enough, on last night’s show the judges didn’t give Colton the usual “massaging my ego” comments, instead they were a touch negative and he was not all that happy about it. Back stage, after his performance, Colton, full of BAD attitude said, “I don’t want to sound cocky or anything, but I don’t care”. Wow, what a jerk, that is cocky! As of 2010, Jennifer Lopez amassed an estimated 55 million record sales worldwide, has Colton? Steven Tyler has recorded music and performed with Aerosmith for more than 41 years and is included among Rolling Stone’s 100 Greatest Singers, can we say the same for Colton? Randy Jackson is a Grammy award winning producer, is Colton? Since Colton has yet to even scratch the bottom of all these Judges’ successes, perhaps he should “CARE” about what they think, duh! Just imagine how far Colton is going to get in his music career, the first bit of negative criticism and he gets upset. News flash Colton! On the road to success, more doors close than open, deal with it or go back to your Middle Tennessee School and don’t come back until you grow up.